Actually, we should be so lucky as to enjoy some rain this month. Despite a few late storms, the National Weather Service records that San Francisco has gotten about 73% of its usual precipitation this season, and San Jose, 60% (and Los Angeles, 18%… wowch). Whether or not it's truly global warming, it's at least a reminder that the Golden State truly has a mediterranean climate, whose bone-dry summers begin about now and can last well into November. Short of replacing your new landscape with rocks, there are a few things you can do to stretch your water budget a little farther. First, waste as little as possible: water before sunrise, when the air is cool and calm, and adjust any spray heads to prevent overspray onto hardscaping or structures. Second, encourage deep, drought-resistant plant roots by watering less often — only every three to five days — but for longer times. And help keep that water from evaporating by mulching with fir bark or compost, two to four inches deep. 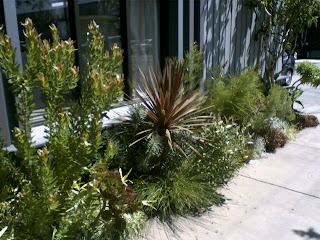 Finally, and this is the big one, consider using plants that require less water to begin with. You don't need a "California native" garden to save water: plenty of gorgeous, non-native trees, shrubs, and perennials can get by with much less water than you might imagine. (If you would like suggestions for some un-thirsty plants that would be perfect in your garden, just let me know.) Lawns are a different story: they are, by nature, resource hogs. But unless you truly need a turfgrass lawn — for kids to play on, or for polo competitions — I can recommend some great alternatives that will be just as easy on your eyes as they are on your water bill. Surviving our hot, dry, long summers actually is not difficult; but since only 2% of the world shares our climate, it does require some creativity. Start thinking now about how you might reduce your water needs and usage — and keep your fingers crossed for a few April showers to prolong the inevitable.